Lassofthemohicans, a 6-year-old mare owned by Gretchen and Roy Jackson’s Lael Stables, will be on the roster of featured horses for the National Museum of Racing and Hall of Fame’s Foal Patrol Season 2, which will debut online Dec. 28 at www.foalpatrol.com. Lassofthemohicans resides at Denali Stud in Paris, Ky. The first season of Foal Patrol, a one-of-a-kind collection of live cameras following the daily activities of in-foal mares, had more than 1.6 million views from December 2017 through September 2018. Lassofthemohicans joins Starr Bear (Double Diamond Farm), Frivolous (Shawnee Farm), Silver Colors (Gainesway Farm), With Honors (LNJ Foxwoods/Claiborne Farm), Viva Sheila (Lady Sheila Stable/Edition Farm), Love and Pride (Three Chimneys Farm), and Comme Chez Soi (Old Tavern Farm) in Season 2. One more horse will be announced prior to the launch of Season 2. 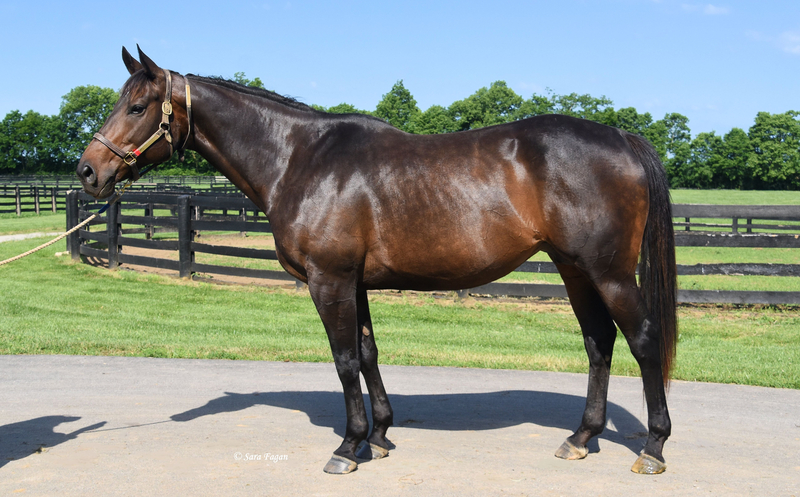 A dark bay mare foaled on March 20, 2012, Lassofthemohicans is a daughter of Indian Charlie out of the Tale of the Cat mare Dream Street. She was purchased by Lael at the Keeneland November 2016 Breeding Stock Sale. Bred in Kentucky by Gaines-Gentry Thoroughbreds, Thomas Van Meter and Fox-Straus KY, Lassofthemohicans raced 11 times between 2014 and 2016. Her lone victory took place in her fourth career start at Gulfstream Park in 2014. She also finished second four times. Trained by Hall of Famer Bill Mott during her racing career, Lassofthemohicans is in foal to Candy Ride with an expected due date of March 25. Denali Stud was established by Craig and Holly Bandoroff in 1990 on more than 700 acres in Bourbon County, Ky. Since its founding, Denali has sold more than $496 million worth of horses. Denali is consistently among the leading consignors of yearlings, weanlings, and broodmares at public auctions in Kentucky and New York. Equally impressive as the commercial success is the racetrack performance of the farm’s graduates. More than 400 stakes horses have emerged from Denali consignments, including numerous racing stars who have gone on to lucrative stud careers, including Animal Kingdom, Uncle Mo, Real Quiet, Deputy Commander, and Champagne Room, among others. For more information about the Museum, including special events and program offerings, please visit our website at www.racingmuseum.org. Flashback to this past Saturday, April 6 when Lassofthemohicans delivered her Candy Ride filly. Denali Stud shared this video of the foaling and how well she did throughout the delivery. Happy (almost) one week to Lassofthemohicans19. Lassofthemohicans Foaling from National Museum of Racing on Vimeo. Lassofthemohicans delivered a bay filly by Candy Ride Saturday, April 6 at 10:06 p.m. After birth, the filly measured at 42 inches tall and weighed 124 pounds. The mare had a quick and easy delivery and both seem to be doing well at this time. "We are thrilled with Lassofthemohicans Candy Ride filly. She has everything that we look for in a young foal with good leg and a nice frame to grow into. During the vet exam this morning following her foaling, the filly was discovered to have a couple broken ribs. This is not uncommon in good-sized foals. We will restrict the foal's turnout to a stall for 10 days to allow the ribs to heal. Turning out a foal with fractured ribs can be dangerous as the broken rib could puncture the lung if the foal is jumping and playing around. A vet will recheck and examine the filly later in the week to ensure they ribs are healing well." Even while recovering, it looks like Lassofthemohicans19 is curious and friendly!